Gather around Mammas of babies and toddlers - there's a bit of an exciting 'Ooh' fest happening here. 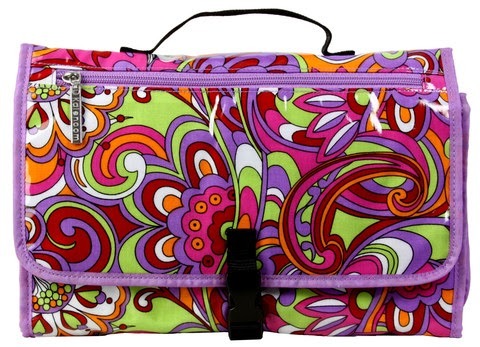 Kalencom New Orleans nappy bags are stunning designer nappy bags that come in the most exciting of styles. (Truly!) I have not seen such funky bags about in all my long years to date as a Mamma. These bags are just so stand out and original. We were sent this stunning baby change bag in chevron-like pastels - her real name is the Spa Buckle Bag and I am attracted by her colour, design and practicality for she is not only Pretty. Dang. Gorgeous but durable and compact too without being small or 'stingy' in her required versatility and usability roles. I have a new bag love! Kalencom New Orleans nappy bags are sold exclusively online at Bubba Bags - an Australian website who deal solely with this brand founded in 1971 in New Orleans, USA. The range available is knock-your-socks-off stunning! I set about putting this new bag to the test on a very recent weekend in Sydney. I was instantly attracted to this change bag when it arrived as a travel nappy bag in particular. I was impressed with its overall lightweight and its ability to flat-pack thanks to the removable bottom insert. With only a 10 kilogram on-board baggage allowance on domestic aircraft in Australia, this was the logical choice for travel in this instance. This bag weighs only around 1.3 kilograms, and gave me ample space and freedom to stuff it with all of my own and baby's necessities. The Spa bag and all of Kalencom's bags in this range, are fully constructed in a heavy-duty, thick laminate coating over a fashionable fabric design which is AZO free and contains no phthalates so no bad nasties near your precious little one. It's that comfortable to wear. The bag is also fitted with built-in pram straps which have fuss-free plastic clips so you can snap the change bag securely onto your pram handle or pram hooks for greater security. These allow you to enjoy ease of access to your possessions without crushing your pram-hood with an ill-placed strap and possibly making your pram unstable. The messenger style Spa bag opens via a single strong magnetic clasp located under the buckle feature on its front. Inside is one large compartment which is very roomy. The bag is lined with a pale grey satin-like Kalencom signature lining. There are elastic loops for holding bottles or other important items that need to remain upright. There are also three pockets along the rear wall for smaller items and essentials like nappy sacks and hand sanitiser. Inclusions are generous and equally lightweight. There's a Thinsulate lined matching bottle bag, (alternatively, it stuffs up nicely with snacks) and a large, lined and zippered pouch for soiled items. Seriously though, I wouldn't use this pouch for wet items - it's just too nice and it's great for storing all those little people things like Band-Aids, creams and Mum personals like lip balm or breast pads. Included also - a huge fold out change mat with ribbon ties. The change mat is equally featherweight and folds up to nothing making this nappy bag essential very easy to store inside it without taking up all the available space like some I have seen. Importantly, it would also wash easily as it is constructed of easy care polyester. Externally, two large pockets located on the sides of the bag are secured with magnetic clasps and also cope well with bottles and other must-have-handy items like a mobile phone, keys or tickets. The bag measures a generous 360mm long, 260mm high, 170mm in width and is fully expandable. It is the perfect sized bag for general use which, thanks to its fabrication, never gets so heavy that it threatens to tip your pram or injure your back. There are four metal feet to protect its base and double stitching all over to ensure it lasts through whatever you can dish out. And dish out we did! We subjected this bag to a very heavy duty weekend on our road test. I packed it to the brim with personal items as well as regular baby bag elements. It was beaten and bashed about at the airport by a flustered Mum (while chasing the toddler); battered in airport security checks; squashed into cabin stowage and poked under airline seats; shoved beneath suitcases in airport shuttles and dragged all over Sydney town on crowded public transport and ferries and thumped into people on countless occasions at the Sydney Opera House and at markets to name just a few instances. At one stage my eldest Daughter accidently tipped her soft drink on the bag and thanks to the laminated coating, it just trickled straight off. Evidence of wear? - surprisingly, absolutely none. My bag still looks new and the sticky spills just wiped clean. It's a very hardy bag and built to handle the task. There are a stunning array of Kalencom bags in the change bag collection on the Bubba Bags website so make sure you head on over to have a look if you're looking for a new nappy bag. The Spa bag featured in this review retails for a very reasonable $99 and there is free shipping available on all nappy bag purchases. There are also matching Quick Change Kits for nappy changes on the go as well as various styles of nappy bags such as backpack options and totes. As a special offer, Six Little Hearts readers receive 10% off any nappy bag purchase site wide on the Bubba Bags website using the exclusive coupon code: sixlittlehearts. Please share this generous and ongoing offer with your Mamma friends! *Please note: Image depicts the Kalencom Spa nappy bag featured in this review which is not the actual prize. Thanks to the generosity of Bubba Bags, they are offering one lucky Six Little Hearts reader the chance to win a Kalencom Quick Change Kit valued at $39.95. The Quick Change Kit is the perfect addition to your nappy bag for fast nappy changes on the go, or an alternative portable change station wherever one's needed. There are a great range of styles to choose from and the winner can have their pick of designs on the Bubba Bags website! Please share the love! Let your friends know about this review and giveaway by shouting out about it using the social media tabs below. Chance plays no part in this promotion. This is a game of skill - most creative / informative answer wins. The total prize pool is $39.95 consisting of one Kalencom Quick Change Kit supplied by Bubba Bags. Winner may choose their preferred design but actual prize will be subject to availability at the discretion of Bubba Bags. Winner will be announced here approximately one week from the giveaway's end. The winner's details will be forwarded to Bubba Bags for prize distribution and may be announced on prize related social media sites. What features do you look for when choosing a nappy bag? That's nicer than my handbag!! Organisation, pockets and a lining that isn't black! it has to have an insulated section for bottles as well as a pullout change mat and long strap so I can hang it over the trolley or pusher when out and about. Compact and chic. Be proud to carry that around with us. My ultimate nappy bag would include the following, look stylish, lots of pockets especially on the outside for quick access to keys, purse and phone, change mat, insulated pockets, light coloured lining so you can find things easily and lastly a strap that doesn't slide off your shoulder. I kind of love nappy bags and I'm not a parent! Laptop space, drink bottle space...so awesome! Insulated pockets, easy to clean and spacious! Oh I adore their bags, especially this one! LOVE the laminate cover to keep the bag easy for cleaning & waterproof. SO cute, but mama proof at the same time! Thanks bunches for the sweet chance ya'll! Beautiful Bag! That's so stylish. If I say a mum with that bag I'd ask her where she bought it, I LOVE it! Thanks! O - OMG! Chevron print is totally in! My nappy bag has to like a Mary Poppins bag. Stylish and roomy to fit everything that i could ever need in case of wee little accidents... or worse. I'm after a nappy bag which is stylish, functional, durable and easy to clean. Everything inside can be easily well-organized. I have been eying these bags off on Instagram. They are gorgeous! My ultimate nappy bad would contain a little miniature helper who would sit in there until I needed something and then hand me what I needed (I am always losing things in my bags). Haha.. but seriously, pockets and zips are great to organise my things, as well as bottle holders so I don't spill them. We like your cute and creative suggestion Kaz - a little helper would be ideal and coming your way is a Kalencom Quick Change kit of your very own to help you out! I love the brightness and size of this bag. I have one similar(in black) that I've had for nearly 5 years, and it is still like new. It is awesome to find a great nappy bag. I like a bag with lots of room for everything that we'd need for a day out. V v v cute! I would love a nappy bag just for all of the stuff I carry round with me daily ha ha! A must have for me are the extra little pockets that are available. I try to eliminate taking a handbag - too much to keep account of otherwise, so I need those extra pockets to put my phone and keys. Having been caught out before when the phone rings and you end up upending the whole bag to find the phone in amongst the hoards of other baby items. Having a long strap is a must also. Placing it over the pram to keep it conveniently secured. And having the strap long enough means that hubby can take his turn in carrying the bag when needed. Hmmm, Most important thing I think is that it needs to be wipeable, I don't want the bag to be ruined because I forgot to close LJs popper!! Haha, and also fun and stylish. Gotta love a versatile nappy bag! Love the colours on this one - very funky! Makes on the go a dream! I look for a zip closure as mostly like this will become my handbag as well so I can tuck my purse and keys away. Loving the awesome colour palette as will match all our outfits!! To me a nappy bad needs to be waterproof, easy to clean, lots of compartments and pockets for storing different items, it must sit comfortably on your shoulders and easily strap to your pram. It must be super cute and stylish and make you look like the most fashionable mama gettin' round town. Big enough for all the necessities, but not bulky. Easy to carry with a wiggly toddler in my arms. Fun prints making it stand out from all the nappy bags at playgroup! I totally need a new bag, BUT I am going to avoid nappy bags as my youngest nearly out of naps and I want a small one! They sure do make them trendy! That it's like Mary Poppins' magic bag. A bag that can fit everything a Mum would ever need and still be carried and look good! easy access and not too much wasted space as in pockets that just collect the ickiness! Big enough to hold cloth nappies, a few sections and preferably something that doesn't look so "mum-ish". I just like normal bags. I need something that doesn't get too dirty, has lots of room and pockets. Non-black lining, so everything doesn't fall into the "Nappy-bag Black Hole", never to be seen or heard from again! I like a water proof compartment for my wallet and mobile phone so that I can carry it without worry in my bag. Being able to be cleaned easily, spilt or leaked milk as you know does not smell too nice, to be able to turn inside out and hose out is an awesome feature! Unisex so dad can lug it around too! Changing nappies on the go isn't glamorous at all... So I need bit of glam in my nappy bag to balance life out!